1/4 x 3 1/2 x 2 1/4 in. Object is a small address book. The contents pages are an accordion-fold between two sheets of magnetic plastic. 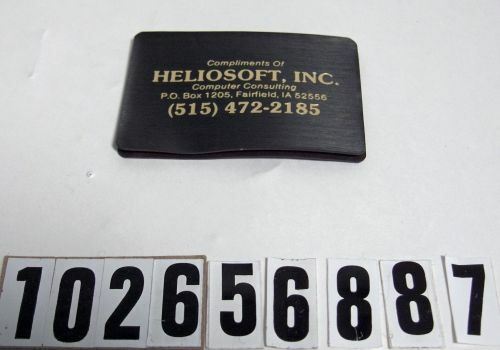 The outside front bears the gold lettering "Compliments of HELIOSOFT, INC. / Computer Consulting/ P.O. Box 1205, Fairfield, IA 52556 / (515) 472-2185".